Recombinant monoclonal antibody to F4/80. Manufactured using AbAb’s Recombinant Platform with variable regions (i.e. specificity) from the hybridoma Cl:A3-1 (recombinant version). Immunogen: Thioglycollate stimulated peritoneal macrophages of mouse origin. Specificity: This antibody recognises the mouse F4/80 antigen, a 160kD glycoprotein, expressed by murine macrophages. 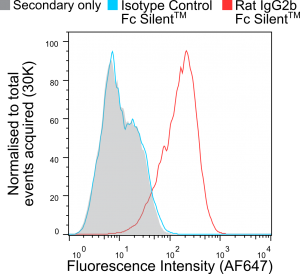 Application Notes: The anti-F4/80 antibody, clone Cl:A3-1, has been very widely used in flow cytometry, microscopy and Western blotting since its generation by Austyn and Gordon in 1980. We are the only supplier of recombinant versions of Cl:A3-1 which, whilst having the same variable domains as the original, has been shown to block hybridoma derived anti-F4/80:APC binding to in vitro generated bone marrow-derived (BMDMs) and ex vivo splenic murine macrophages. 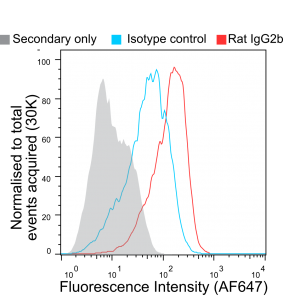 This was tested using both the recombinant version of the original isotype (rat IgG2b) as well as a murinised version (IgG2a, Ab00106-2.0). Further testing on BMDMs shows that our Fc Silent™ rat IgG2b is a valuable new reagent which shows distinct labelling of F4/80-positive cell populations, whilst the isotype control shows no binding, suggesting that only the antigen binding domains are involved in binding, promoting precision of labelling. The murinised versions will be valuable tools in the study of the role of the murine macrophage in vivo without the artefacts rat-derived antigen being co-administered may harbour. Particularly the murine IgG2a (Ab00106-2.0) should be an excellent candidate for macrophage depletion studies, with the Fc Silent™ (Ab00106-2.3) version being the ideal negative control. Using our recombinant production platform, any species and isotype are possible and our Support Team (support@absoluteantibody.com) will be glad to help you with finding the right variant to match your experimental needs. Note on publication: Describes the making of the antibody and its specificity for macrophages (Flow Cytometry) and proposes its potential use as a marker. 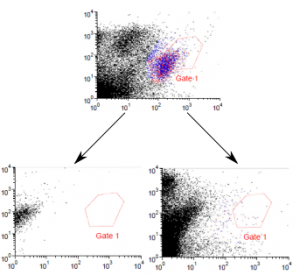 Competitive flow cytometry analysis of Ab00106-2.0 and Ab00106-8.4 with a commercial antibody. Competitive flow-cytometry assay between Absolute Antibody anti-F4/80 (Ab00106) CI:A3-1 variants and an existing commercial anti-F4/80 antibody. Mouse (Mus musculus) splenocytes were labelled ex vivo with a commercially available APC-labelled anti-F4/80 antibody and APE labelled anti-CD11b antibody and subject to flow-cytometry analysis (A), in which a small subpopulation of F4/80-CD11b positive cells may be observed. Subsets of commerical anti-F4/80 antibody-labelled splenocytes were also subsequently incubated with unlabelled versions of either the rat ( Rattus norvegicus ) IgG2b chimeric version (Ab00106-8.1, B) or mouse IgG2A chimeric (Ab00106-2.0, C) version of CI:A3-1. Loss of the F4/80-CD11b positive subpopulation may be observed, demonstrating displacement of the commercial antibody and the specificity of CI:A3-1. Detection of F4/80 on bone marrow derived macrophages by recombinant anti-F4/80 (Rat IgG2b) compared to isotype control (anti-fluorescein [4-4-20 (enhanced)] IgG2b (Ab00102-8.1) and background staining of secondary antibody (Polyclonal Goat anti-rat IgG H+L). Detection of F4/80 on bone marrow derived macrophages by Fc Silent™ recombinant anti-F4/80 (Rat IgG2b) (Ab00106-8.4) compared to isotype control (anti-fluorescein [4-4-20 (enhanced)] Fc-Silent IgG2b (Ab00102-8.4) and background staining of secondary antibody (Polyclonal Goat anti-rat IgG H+L).